My cell phone rang during a reunion with my Elder cousins held in Iowa the last weekend in July. The caller ID showed an incoming call from my neighbor, Ida Mae, from Colorado, inviting me to share in a small sampling from her glorious garden. My heart nearly broke as I informed her that I would love to partake, but it would be quite a trek from my Iowa motel room to her backyard. “Oh, well, when you get back just give me a call,” she said. I promised with all of my heart to do just that and went back to a party filled with childhood memories. To understand that last statement, you need to understand a different era in a place called Kansas; a time when families gathered for Sunday dinner following church. There were no weekend activities like volleyball or softball tournaments for the kids. No television, so certainly no Sunday football games to watch. Instead, the women hustled around preparing Sunday dinner, the men sat around discussing farm prices or whatever else men talked about in those days, and we children stayed outside, spring, summer, fall and winter, playing games popular at the time. I could not for the life of me tell you what games those were, but I do recall a lot of running. When a shout from inside signaled dinnertime, we scrambled into a house filled with the smell of food and the voices of aunts, uncles, cousins and grandparents, teasing and laughing. After dinner, the adults remained seated around my grandmother’s round oak table to let dinner settle as they replayed the events of the week while the children returned to the yard to resume their games; all, that was, except my cousin Faye and I who happened to be the eldest girls and thus the designated dishwashers. Truth be told, I think Faye and I really enjoyed that time together to chat and moan our mistreatment. That grumping, always with an underlying laugh, continues today anytime we get together. While my mother and each of her siblings brought something to the party, it was Faye’s parents, Uncle Frank and Aunt Jean, who seemed to fill up a room. Uncle Frank, now deceased, was ever the prankster and tease, while Aunt Jean brightened every event with her Texas charm while giving as good as she got from her sometimes dark-humored Kansas in-laws. 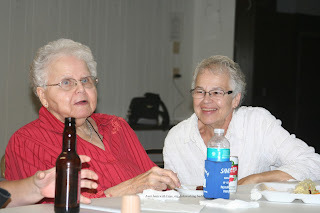 Attending this cousin reunion and watching my Aunt Jean enjoy her children, grandchildren and great-grandchildren, it dawned on me that this wonderfully charming woman from Texas continues to give as good and she gets and much more. The room around her absolutely vibrated with love and I felt honored to find myself wrapped up in it. I hated telling everyone goodbye when the reunion ended, but Ida Mae made up for it on my return to Colorado. True to her promise, she led me through her garden pulling and cutting, and I came home with bags of beets, turnips, onions and a lovely head of cabbage. I turned a portion of that cabbage into a scrumptious salad based on a recipe I found in the Pony Express Cookbook, Gothenburg Women’s Club, 20th Anniversary Edition, that I picked up at the historic Pony Express Station in Gothenburg as I made my way through Nebraska on my return from Iowa. Since the cabbage stays fresh and crisp for several days, you could easily double this recipe. 1. 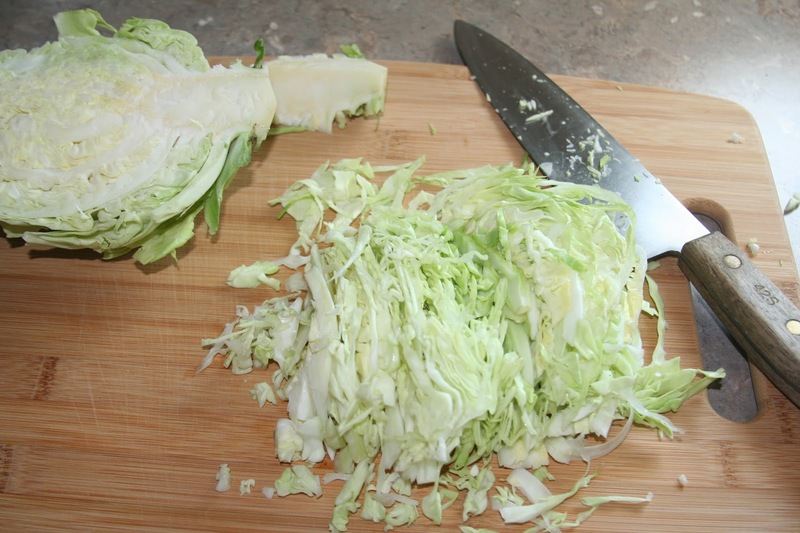 Place shredded cabbage in a glass bowl. Sprinkle sugar over cabbage and let stand at room temperature while making dressing. 2. Combine vinegar, mustard and celery seed in a small saucepan and bring to a boil over medium heat. 3. Remove mixture from heat, add oil and season with salt and pepper to taste. Place saucepan back on heat and return mixture to a boil. 4. Pour hot dressing over cabbage and toss to combine. 5. Store tightly covered in the refrigerator for at least eight hours or over night before serving.